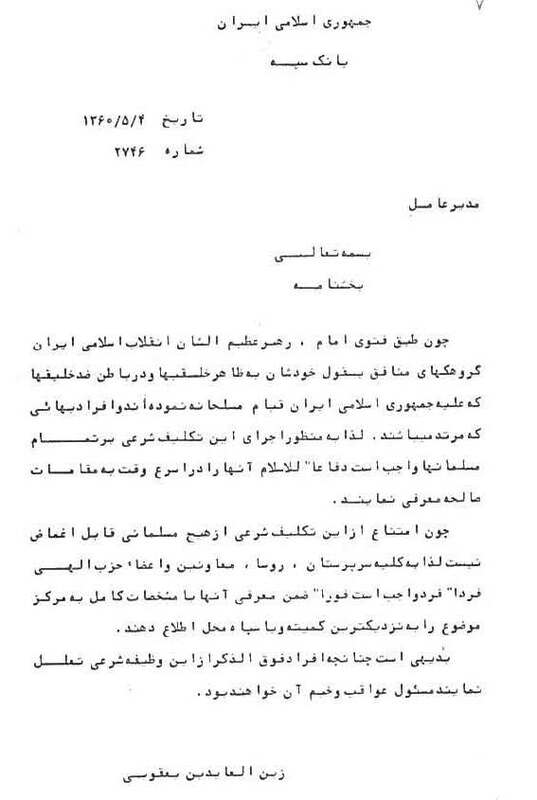 In this document, the General Manager of Sepah Bank has issued a memorandum in which, with reference to the Fatwa of Ayatollah Khomeini, Bahá’ís are considered apostates and therefore, as a religious obligation, it is imperative for all Muslims to introduce Bahá’ís to the closest branch of the Committee or the [Revolutionary] Guard. Since, in accordance with the Decree of the Imam, the Exalted Leader of the Iranian Islamic Revolution, the divisive cells, who appear to claim to be advocates of the masses, yet inwardly they are against the masses and have arisen in armed conflict against the Islamic Republic, and the Bahá’ís, who are apostates, it is binding upon all Moslems to fulfill this religious duty for the defense of Islam and report these people to the proper authorities. Since reluctance to perform this religious duty by any Moslem is unforgivable, it is therefore incumbent upon all supervisors, general managers, managers, and members of the Divine Party, each and everyone, in addition to reporting these people with detailed and exact description to the center, to appraise the local Committee and the Guards of the issue. Clearly, if the above mentioned individuals falter in performing this religious duty, they shall be responsible for its dire consequences.